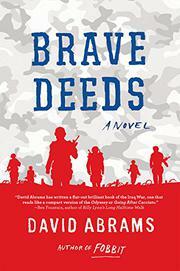 Abrams (Fobbit, 2012) follows his award-winning debut with a more empathetic but no less bitter take on the Iraq War. In the Land of Not Good, Staff Sgt. Raphael Morgan, "dismembered but not disremembered," has been killed by an improvised explosive devise, "obscene pieces of him flying through the bomb-bloom air." A band of brothers, troops he led, has decided to attend his memorial service at FOB Saro across Baghdad from their Taji camp. However, officers have denied permission. That’s irrelevant to troopers Arrow, Park, Drew, O, Cheever, and Fish. They steal a Humvee and go AWOL. The Humvee breaks its drive shaft, and the six, edging past death at every door, must hoof it across the "chaotic center of terrorism" amid "al-Qaeda, Mahdi, Ba’ath, and Badr clashing their ideologies and ambitions of evil." Abrams offers an unusual narrative, first person plural, with points of view discernible only by process of elimination, a subtle reframing of the Rashomon effect. Chapters are long and short, one a mere 38 words, another a prose poem that's an homage to legs, the infantryman’s mode of transportation. With multiple narrators, each trooper is seen through a different squad member’s eyes. There’s Arrow, distant son of more distant parents, who falls naturally into a leadership role, or the Hajji-hating Fish, years of promotions and demotions turning him into the private soldier with a "shine of gray at his temples" and the ability to shoot prisoners without remorse. As the six march across Baghdad, the heat, dust, and broken buildings stand as warnings until the action explodes in short, spare declarative sentences, every bullet another shot at the cruel and illogical aspects of war. A powerful story on its surface, a soldier’s story laced with vulgarities and gallows humor, but also a story holding deeper interpretations of our troubled Middle Eastern misadventures.